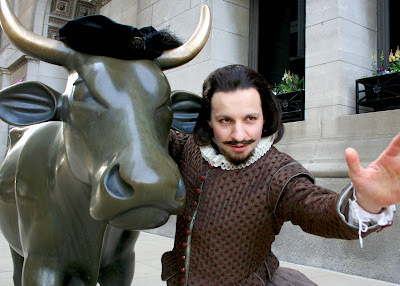 Talk Like Shakespeare Day, an occasion for citizens from Chicago and across the globe to celebrate Shakespeare's 448th birthday by bringing the spoken words of Shakespeare into their daily lives. The holiday, which originated in Chicago in 2009, became a worldwide sensation garnering extensive national and international media coverage and more than one million hits to TalkLikeShakespeare.org. Tales of child deaths that plagued his birth family, and later the death of his own son, Hamnet, at age 11, lend a human air and compelling back story. As the parent of an 11 year old son, that particularly struck a chord with me. Since we've been doing a long form exploration on how theatre people, musicians and other creatives balance their work and parenting, and how the two worlds collide and influence each other, this was an interesting angle. Simon Callow is a talented tale teller and a joy to spend an evening with. The British film and stage actor is know for his roles in Shakespeare in Love, Four Weddings and a Funeral, Postcards from the Edge, A Room With a View and Amadeus. Shakespeare is being celebrated around the world this week, from Chicago to London to Armenia, in recognition of the man who engineered more than 154 sonnets, 37 plays, 1,700 original words and innumerable phrases. On April 23 Shakespeare's Globe Theatre in London will launch its Globe to Globe Festival, part of London's Cultural Olympiad, beginning a two month international event presenting all 37 plays from Shakespeare's canon in 37 different languages (including Chicago Shakespeare's Othello: The Remix, The Q Brothers' hip-hop adaptation of Othello, opening in London May 5). Talk Like Shakespeare Day has even sparked a movement, originating in Armenia, lobbying for the inclusion of "Shakespearean" alongside "Pirate" and "Upside Down" as an official language option on Facebook. Photo courtesy of Chicago Shakespeare Theater. 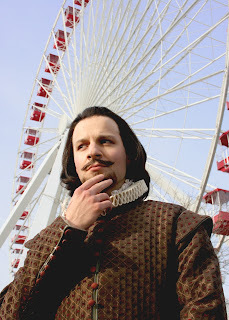 "William Shakespeare" (portrayed by David Wilhelm) celebrates his 448th Birthday on Monday, April 23, 2012 in Chicago, as part of "Talk Like Shakespeare Day" by taking in some of Chicago's best-known landmarks including the Ferris Wheel on Navy Pier. 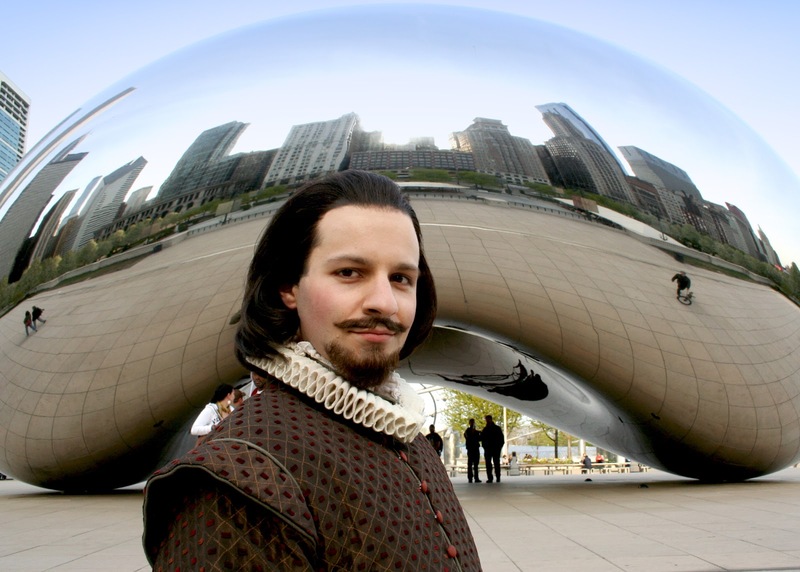 Among the many visitors to Navy Pier, the Midwest's most visited tourist destination, on April 23 will be William Shakespeare himself. Those who talk like Shakespeare to "the Bard" will receive free rides on Navy Pier's iconic Ferris Wheel from 10 a.m. to noon. Shakespeare will dine at Harry Caray's Tavern on Navy Pier, where a special Shakespeare-inspired menu will be available from noon to 2:00 p.m. Diners who talk like Shakespeare at Harry Caray's Tavern will be entered into a raffle to win a $100 Harry Caray's Gift Certificate, four Pier Park Passes, free Navy Pier parking and four Tickets to Chicago Shakespeare Theater's summer musical Disney's Beauty and the Beast. "William Shakespeare" (portrayed by David Wilhelm) celebrates his 448th Birthday on Monday, April 23, 2012 in Chicago, as part of "Talk Like Shakespeare Day" by taking in some of Chicago's best-known landmarks including Cloud Gate in Millennium Park and the bull statue at the Chicago Cultural Center.